Groups include a bulletin board, calendar, chat, discussions, and shared files. Depending on a particular group's settings, administrators, moderators, and members may have differing levels of access to these features. You can join the group, request an invitation, or ignore an invitation you've received. View information like the group's description and administrators. See upcoming group calendar events. See alerts for activity in discussions in which you've participated. The group calendar shows events related to the group's activities. 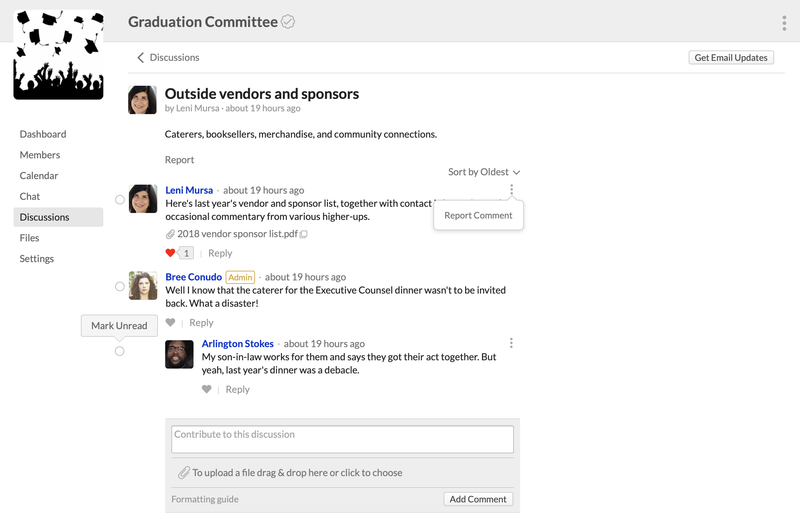 Group administrators and moderators can add events to the calendar. Members cannot add events. Calendar events display on the group's Dashboard view. They also display on members' personal calendars (when they check My Groups) and Home > Dashboard views. Chat, if enabled by the administrator in the group's settings, lets group members have real-time conversations. Any member can view transcripts of past chats (which are organized by date). Discussions are pretty straightforward: group members post comments and replies. All group members can participate in a discussion; who can start a discussion depends on what's established in the group's settings. Give it a title and a topic. Both are required in order to publish a discussion for the group. Check whether you wish to publish the discussion. Published discussions are visible and available to all group members. Unpublished discussions are visible only to the person who added it. You can see your own unpublished discussions by selecting Drafts from the drop-down at the top of the group Discussions view. Choose whether to Pin the discussion: if pinned, it will remain at the top of the discussion list until it is removed or the pin expires. Group members can comment, reply to comments, and reply to other replies. Group admininstrators can delete any discussion, comment, or reply. Moderators can delete comments and replies. Click to report a comment. Files gives your group a place to upload and view any kind of file related to the group's activities. All group members can view/download files and add folders. Uploading permissions are established in the group's settings. Group admins and moderators can rename, move, and delete any file. Are there any settings/options about sending updates/notifications via email or text message related to happenings on a group page? Sending updates/notifications by email and/or text would be a tremendous help. The invitations send an email, so people who create groups tend to assume that notifications go out by email. Instead, the members have to open the Group tab and go to the Bulletin Board (if I've got that right). One faculty member discovered this by accident. She invited a student group to a game night at her house tonight, then discovered this morning that one of her children is ill. She sent a notification changing the place, but had some students contact her later to see if it was still on at her house... She's less enthusiastic about groups now.